Metal-free-fixed prostheses are increasing because of its esthetic superiority and satisfactory mechanical behavior that ensures longevity. Moreover, rehabilitations with dental implants require special care in areas with peculiar esthetic significance, as in single implants located in the anterior maxilla, where the surrounding soft tissue plays a prominent role in the restoration of esthetics. Therefore, combination of fixed prostheses on implants and teeth in the anterior region still remains a challenge., This case report describes a technique for copying the gingival profile of the patient in oral rehabilitation with prostheses on implants and fixed prostheses involving anterior region. 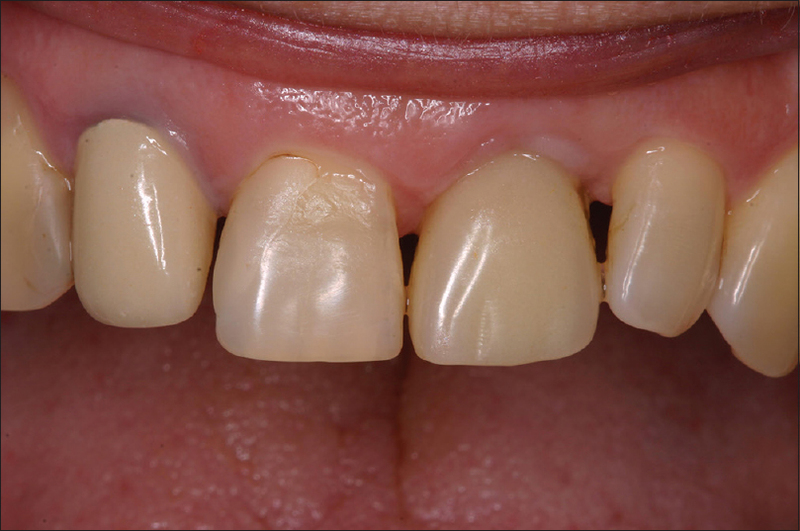 A 53-year-old female patient presented with a missing upper left central incisor. A 10.5 × 4.1 mm dental implant (S.I.N. Implant System, São Paulo, SP, Brazil) was installed, and a temporary crown, made of acrylic resin (Duralay-Polidental, Cotia, SP, Brazil), was positioned on the implant. The patient waited 4 months before to complete the treatment. After this period, a clinical examination revealed a purple outline of the gingival margin surrounding the upper right lateral incisor, indicating that the patient had inappropriate boundaries. There was also asymmetry of the incisal edges of these teeth, which created disharmony of the lip contour, evident during a smile [Figure 1]. The upper right central and upper left lateral incisors were prepared to receive ceramic laminates, while the upper right lateral incisor was prepared to receive a full crown. The partial teeth preparations were carried out using guides of about 0.8 mm on the buccal surface, respecting the inclinations of the middle, cervical, and incisal shares of the crown. The incisal reduction was 1.5 mm. The gingival contour site of the upper left central incisor was properly conditioned by the temporary crown [Figure 2]. During the impression procedure, the implant transfer was customized by copying the gingival profile. The customization was done by connecting the attached temporary crown to the implant analog in a portion of the condensation silicone (Zetaplus, Zhermack, Badia Polesine, RO, Italy) that was properly handled and stored in a glass Dappen dish. Thus, a copy of the profile of the gingival prosthetic crown was obtained [Figure 3]. 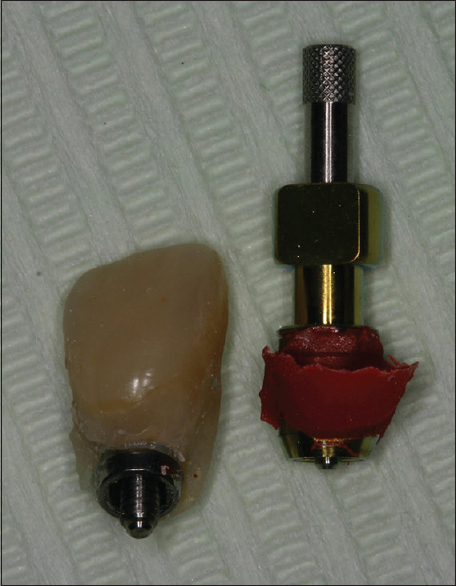 The transferor of the implant replaced the temporary crown, and the space was filled with red acrylic resin added by the brush technique [Figure 4]. After curing of the acrylic resin, the customized transferor was removed from the Dappen dish, and the marginal contour could be compared with the provisional crown [Figure 5]. The customized transferor then was connected to the implant. 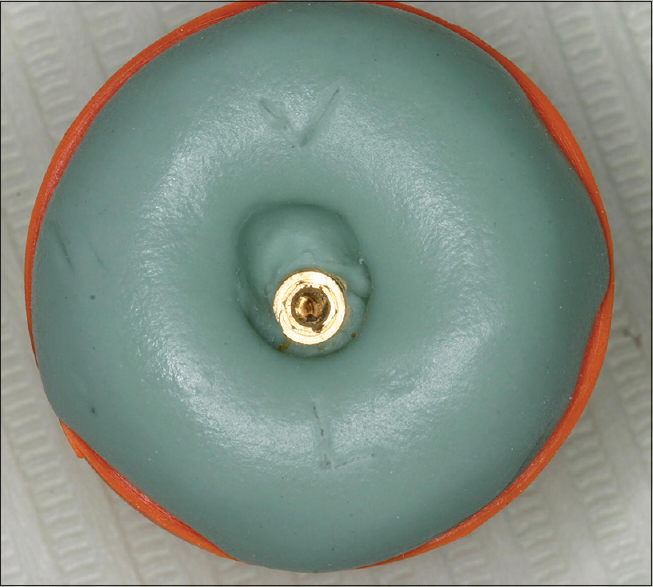 The impression was made using a double-mixing with a double-cord technique (#00 and #0 cord, Ultrapak–Ultradent, S. Jordan, UT, USA). A previously manufactured coping was connected to the implant. An additional silicone (Flexitime, Heraeus Kulzer, Hanau, HE, Germany) impression material was used for impression, including the transfer impression. Light-body material was inserted while the second cord was being removed. The corresponding putty body material was immediately manipulated according to the manufacturer's instructions and inserted in a stock tray that had been previously selected. After setting the material, the tray was removed from the mouth of the patient [Figure 6]. The temporary crowns were luted with temporary cement (RelyX Temp, 3M ESPE, St. Paul, MN, USA). The upper left central incisor received a customized abutment [Figure 7], which replaced the temporary crown originally installed. The crown was manufactured with Lava zirconia ceramic system (3M ESPE, St. Paul, MN, USA). The other prostheses were made with IPS e.max Press ceramic system (Ivoclar Vivadent, Barueri, SP, Brazil) and cemented with the resin cement RelyX U100 (3M ESPE, St. Paul, MN, USA) [Figure 8]. The installation of the prostheses on the implant occurred in the same session of the rehabilitation of other elements. Follow-up examinations were made annually and did not present irregularities or deficiencies in the prostheses. The use of metal-free dental prostheses still generates some doubts in some clinicians in relation to mechanical properties; however, well-argued literature has reported its success in rehabilitation. Clinical studies have been published and further research is carried out constantly to improve the materials providing more satisfactory final results. The installation of well-positioned temporary crowns by following the procedures established by David can facilitate the installation of permanent crowns because it ensures the appropriate conditioning of the gingiva. It also promotes good esthetic outcomes. This is especially important when the use of provisional crowns is required by the impossibility of immediate loading of the implant. It is important to note that two different ceramic systems were used in this case, not affecting the esthetic outcome. The Lava zirconia ceramic, used on the prostheses on implants and which uses solid-sintered zirconia, has several significant advantages: increased strength and toughness, decreased elastic modulus, and the remarkable property of transformation toughening. The IPS e.max Press consists of precolored ceramic pellets or ingots of different shades that offer high biocompatibility, natural appearance, and dental plaque resistance. The customization of the implant transfer reported in this clinical case is similar to that proposed by den Hartog et al. It increases the predictability of treatments where esthetics is the key to success. The conventional implant impression using prefabricated components does not necessarily reproduce the anatomical structure; hence, the emergence profile created is not ideal. In this clinical report, acrylic resin was used for the customization of the impression post. Other materials, such as low-viscosity composite resins, can also be used intraorally. In this case, it was important to polymerize the intraoral materials without delay to avoid the collapse of the gingival tissue. Otherwise, the use of acrylic resin extraorally prevents the direct contact of the monomers with the gingiva and it working in a dry environment. Therefore, the use of this simple and fast procedure permits obtaining an exact copy of the gingival profile allowing the prostheses to be more integrated into the oral environment, including the surrounding soft tissues what is crucial in rehabilitations involving anterior teeth. Poggio CE, Ercoli C, Rispoli L, Maiorana C, Esposito M. Metal-free materials for fixed prosthodontic restorations. Cochrane Database Syst Rev 2017;12:CD009606. 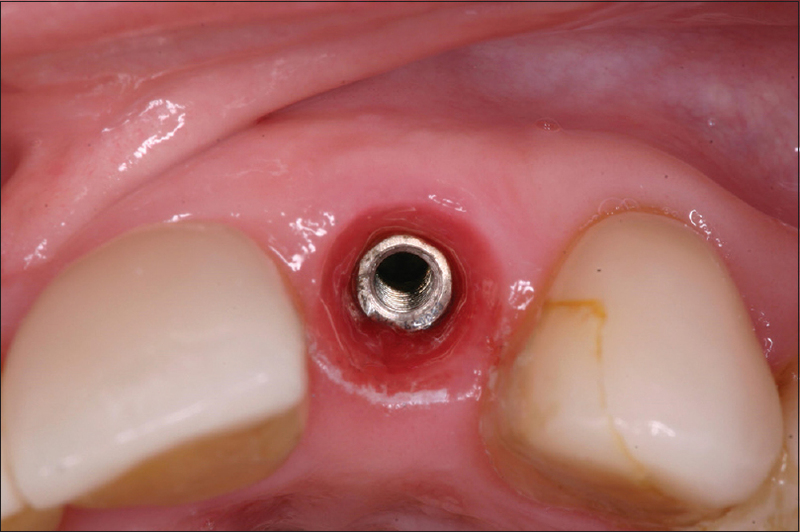 Suphanantachat S, Thovanich K, Nisapakultorn K. The influence of peri-implant mucosal level on the satisfaction with anterior maxillary implants. 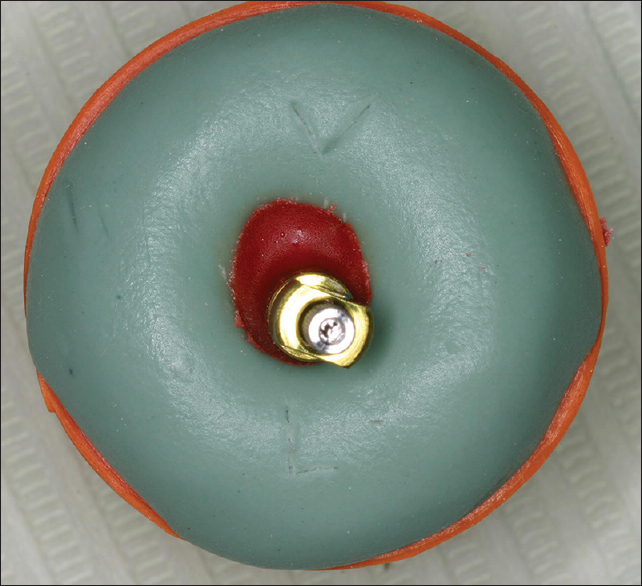 Clin Oral Implants Res 2012;23:1075-81.
den Hartog L, Raghoebar GM, Stellingsma K, Meijer HJ. Immediate loading and customized restoration of a single implant in the maxillary esthetic zone: A clinical report. J Prosthet Dent 2009;102:211-5. Shah R, Laverty DP. 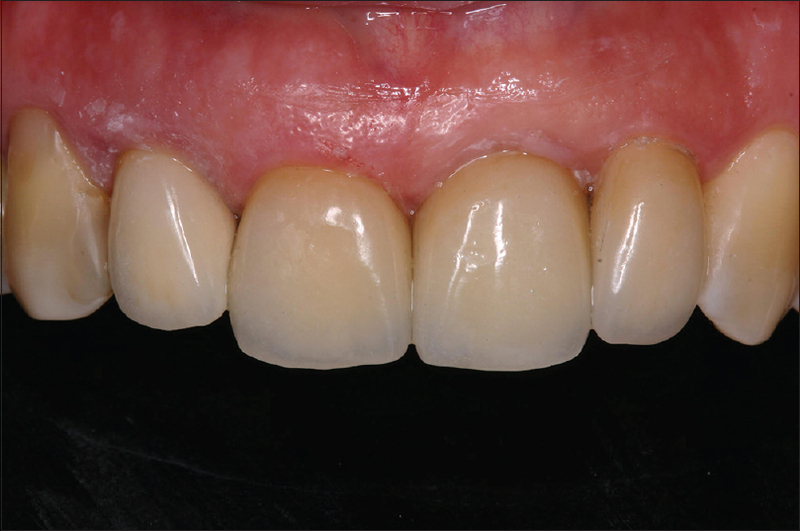 The use of all-ceramic resin-bonded bridges in the anterior aesthetic zone. Dent Update 2017;44:230-2, 235-8. Della Bona A, Kelly JR. 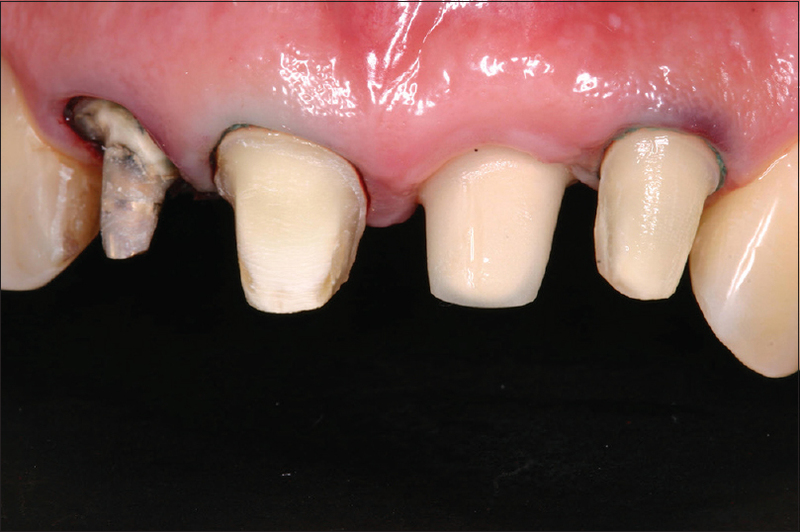 The clinical success of all-ceramic restorations. J Am Dent Assoc 2008;139:8S-13S. Aydin C, Yilmaz H, Ata SO. Single-tooth zirconia implant located in anterior maxilla. A clinical report. N Y State Dent J 2010;76:30-3. 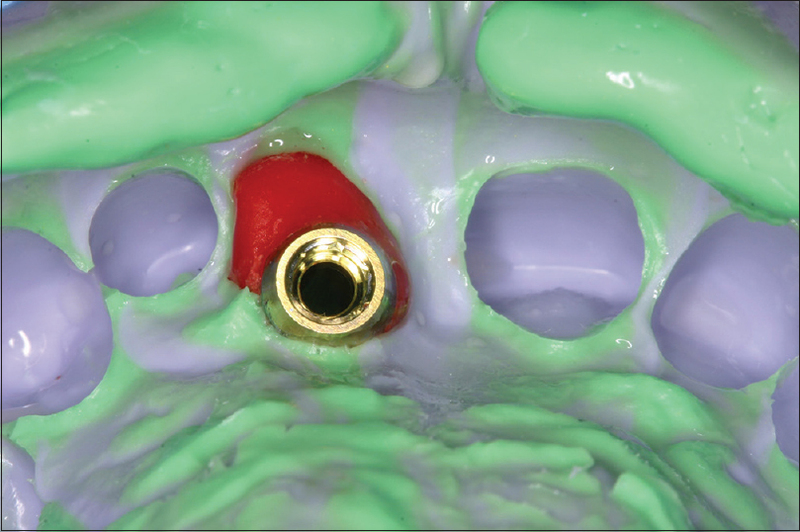 David R. Provisional restoration for an osseointegrated single maxillary anterior implant. J Can Dent Assoc 2008;74:609-12. Henry PJ, Liddelow GJ. Immediate loading of dental implants. Aust Dent J 2008;53 Suppl 1:S69-81. Ntounis A, Petropoulou A. A technique for managing and accurate registration of periimplant soft tissues. J Prosthet Dent 2010;104:276-9. Papadopoulos I, Pozidi G, Goussias H, Kourtis S. Transferring the emergence profile from the provisional to the final restoration. J Esthet Restor Dent 2014;26:154-61.